PivoTrim Line - 100 pcs. A Collapsible, Wall Mounted Clothing Storage Rack. Buy more and save more with quantity discounts. Stuff Points: Earn 15 points when you buy this stuff. Currently Unavailable. Sign Up For The Waiting List. Out of room for all those clothes? Or do you just need a more convenient place to hang clothes when doing your laundry? 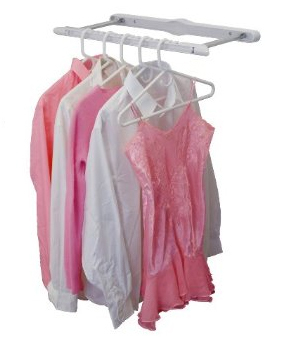 The The Hang 'N Hide wall mounted clothes rack quickly creates extra space for your clothes, right where you need it. It is an instant solution to create more clothing storage in any room of your home or office. Perfect for in the laundry room, dorm, garage, basement, next to your ironing board, or inside a closet. The Hang 'N Hide pops out to instantly create temporary or permanent laundry storage space. Once you are done using it, just press it in to fold the unit flat. It stores neatly on the wall, only sticking out a couple of inches when completely collapsed and not in use. You will be able to maximize wall space where ever you mount it because the Hang 'N Hide can hold up to 17 hangers, and a total of 10 lbs. Compatible for mounting just about anywhere, you can quickly and easily install this retractable clothes hanger in any closet or on any wall of your home. It is made with strong ABS plastic and features chrome plated swing arms that collapse flat and fold out of the way when not in use. It comes with easy to follow instructions and all of the hardware you need. If you need some extra room to hang clothes on an wall, the Hang N' Hide is the perfect solution. 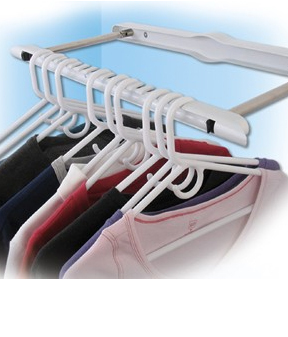 It Instantly creates a convenient clothing rack, and then allows you to make it all but disappear when not in use. The Hang 'N Hide is a great way to provide guests with additional storage when mounted on the wall or back of the door in a guest room. Hang one next to your ironing board to hold freshly ironed slacks and shirts to prevent wrinkling and add convenience. It is also ideal when placed in your laundry room to hang clothes as they are removed from the washer or dryer, and can even be used to air dry shirts instead of sending them through the dryer in the first place. When you hang clothes right after washing, it can significantly reduce wrinkling, so you have better looking clothes with less effort. The Hang 'N Hide is also great for use in a bedroom closet for extra storage, or just to arrange outfits prior to dressing. It is great for college student or anyone else with limited closet space. This wall mounted laundry holder features a durable plastic mounting plate and hanging bar, and the side poles are made of steel for strength and durability. The hanging bar features individual grooves for each hanger, and can handle up to 17 garments at once. Maximize the wall space in your laundry room, dorm, closet, basement, or garage with this patented laundry hanging rack. To use the Hang 'N Hide, simply extend the side arms, and slide the hanging bar away from the wall until it locks into position. 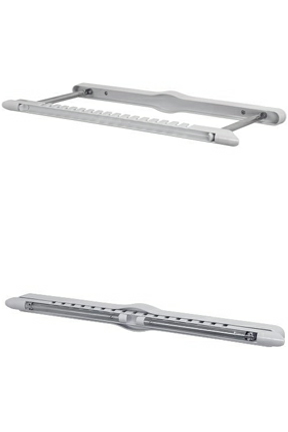 When extended, the hanging bar extends 11" off the wall to accommodate any size garments. Slide the hanging bar back and fold the arms back down when you are done using it. When not in use, the Hang 'N Hide measures only 2" off the wall. Order Yours Today! Dimensions Expanded 25" x 11.125"
Dimensions Collapsed 25" x 2"
Hang 'N Hide Clothes Rack - An easy way to always have a spot to hang clothes when you need it. Pull it out to use it, and then quickly collapse when not in use. Perfect for the laundry room or closet. This product is working well. Works just as hoped. We needed a rack to hang damp clothes that we elect not to put in the dryer. This rack certainly fills that need. The fact that it 'collapses' when not in use is a major plus. It is easy to install and well worth the purchase. I recommend it. Have a question about this stuff? Ask Now. Pull The Water Out Of Your Clothing in Just Minutes. A Safe & Natural Way to Remove Stains and Pre-Treat Laundry. A Safe & Natural Laundry Solution! Iron Clothes Anywhere! A Fold-able Mat With Integrated Silicone Resting Pad. A Lightweight And Portable Washing Machine. Electric Powered With Computer Controls. Incredibly Strong Bond. Way Better Than Suction. Hang Up To 10 Lbs. Extra Large For Maximum Efficiency. Soften Clothes Without Harsh Chemicals. Incredible Capacity, Fast Drying, And Lightweight Portability. Get exclusive discounts, and hear about new stuff first! We will never share your info or become annoying. Promise. Simply Good Stuff, Inc. All Rights Reserved.